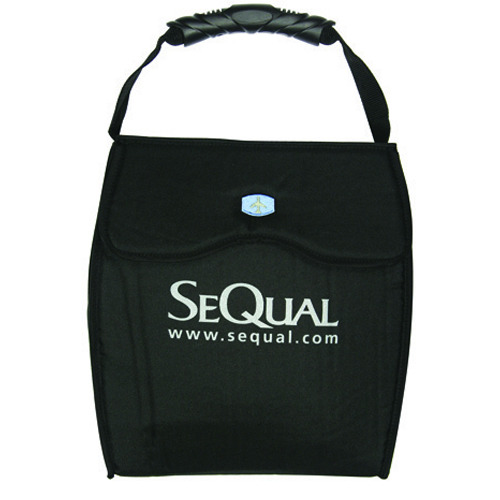 The SeQual Eclipse 5 Accessory is the perfect accessory to help keep yourself organized. Not only does it have enough room to hold multiple accessories, it has a velcro flap which secures any and all belongings in your accessory bag. Not to mention, this accessory bag is extremely durable and can stand up to the tests of traveling and everyday use. Transporting the Eclipse 5 Accessory Bag is a breeze! This bag can be carried in your hand or you can slide it over the telescoping handle of the Eclipse 5 Travel Cart. By sliding it over the travel cart handle, you will have a free hand available and you will save some energy by not carrying it. The Eclipse 5 Accessory Bag also has an FAA approval symbol on the top flap, making your airport experience that much easier!